Few things can round out a dinner party or take the chill out of a gloomy day better than a perfectly executed baked treat. Similarly, only the rarest of kitchen mishaps can elicit the same howls of frustration as a dessert gone awry – the glaze that boiled into hard candy, the uneven cake, the mysterious metallic flavor you can’t quite pin down. The fickleness of baking can be enough to drive even the most confident cooks from their mixers. 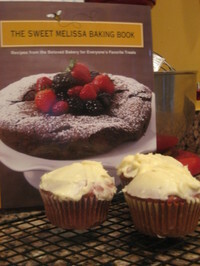 Melissa Murphy’s The Sweet Melissa Baking Book takes the guesswork out of baking while offering up an array of fun, sweet treats. Her conversational style guides the reader through the book, providing anecdotal history on family traditions and customer favorites from her Brooklyn patisseries. Many recipes include suggestions for storage, cutting like a pro and serving ideas. Most importantly, all of the recipes can be executed with equipment found in a reasonably stocked kitchen. Although Murphy’s style focuses on simple recipes executed well, her options turn up the volume on classic favorites. Murphy’s Guinness gingerbread, which I baked for a pregnant friend on St. Patrick’s Day so she could keep her stout tradition alive, debuted as a rich, dense cake. The use of high quality chocolate and Guinness laid an earthy platform and the surprising addition of white pepper gave our tongues an extra kick. Fair warning: this recipe requires you to simmer the stout in a saucepan for a few minutes, causing your kitchen to smell like a frat house on Sunday morning. Luckily the baking bread pushes this aside with clouds of delicious goodness once it’s in the oven. The sweet potato bread with cinnamon-rum orange glaze is a welcome addition to my stockpi le of go-to quick breads. Can anything beat the smell of a great bread rising in your oven? Murphy’s sweet potato bread is no exception. The generous use of spices gave our entire apartment a heavenly, seasonal perfume that took me back to fall afternoons and cozy sweaters. The bread arrived with enough softness and spring to double as a pillow. Murphy’s red velvet cake with cream cheese was the only disappointment I encountered. Maybe I set my hopes too high; I’d been obsessed with red velvet since eating it in cupcake form in New York. 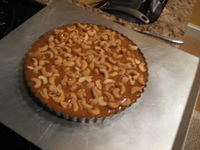 I tried to replicate it here with Murphy’s recipe but something fell short. The batter, an amazingly rich concoction with cocoa, cinnamon and buttermilk, was good enough to eat on its own with a chilled glass of milk (I say this with confidence since I ate as much batter as I baked). Unfortunately, the batter lost its depth in the baking process and the decadent flavors faded to the background in the final product. The addition of the frosting did not help – its over-the-top sweetness screamed over the cupcakes and overwhelmed the flavors. 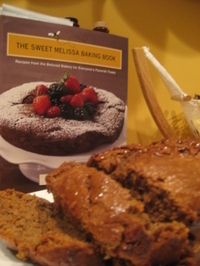 Overall I’m pleased to have Sweet Melissa’s Baking Book in my arsenal. She has dozens of other recipes I’m itching to try. An entire section dedicated to baking with fresh fruit which will surely fuel my farmer’s market trips this summer and her final section highlighting favorite treats to share as gifts will certainly be stained and dog-eared by mid-December. Jeffrey P. Roberts' "The Atlas of American Artisan Cheeses"
There are some books that attract Foodies for their engaging prose and subject matter - "Kitchen Confidential" and "The Omnivore's Dilemma" are just two of the numerous examples that have emerged in increasingly greater numbers over the past decade. But there are others whose value lies more in the depth of the information they provide - reference books that become go-to volumes for Foodies who want to learn more about things like how to make salumi (Michael Ruhlman's "Charcuterie: the Craft of Salting, Smoking and Curing") or a broad range of esoteric details (David Kamp's "The Food Snob's Dictionary"). 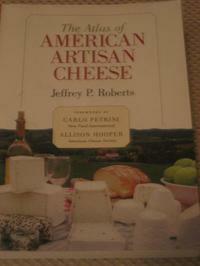 For me, the most valuable resource book I have come across since I started writing about cheese is Jeffrey Roberts' "The Atlas of American Artisan Cheese." 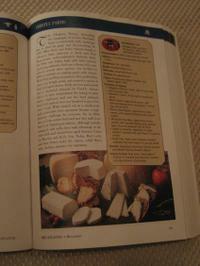 Unlike other volumes that provide introductions to cheese-making or the differences that distinguish the various categories of cheeses, The Atlas serves a very specific function: it provides a catalog of almost 350 artisanal cheesemakers throughout the United States broken down by region. Jeffrey Roberts took on the daunting task of cataloging these cheesemakers as a way to celebrate and acknowledge their commitment to preserving (and in some cases resurrecting) traditional foodways and methods of production. 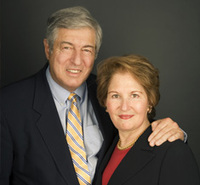 Through interviews and surveys, he verified that each cheesemaker he profiled in the Atlas was a licensed dairy producer who worked primarily by hand to craft the cheeses that they make and sell. Thankfully, Roberts did not simply dump all of this data in his readers' laps. Instead, he dedicates a page (and in some cases, a little bit more) to a narrative that gives some background information about each producer. He shares stories about how cheesemakers came into the trade (it's interesting to note just how many emerged from dairies that sought to profit from the surplus milk their herds were producing), who runs the operation, and how they perceive the impact of what they do. Despite the brevity of these descriptions, they definitely help to put a human face on each farm, elevating this book beyond the ranks of simple reference volumes. For those who use the book for its reference purpose, Roberts also provides a more cut-and-dried recitation of the cheesemaker's details. These include the year it was established; the owners and cheesemakers; the address, telephone, email and website (where possible); and the types and varieties of cheeses produced. 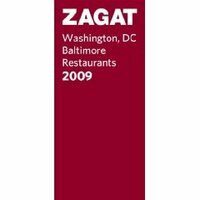 Each page also alerts readers to whether or not visitors are permitted and where the establishment's cheeses can be found, though this information is rarely detailed beyond an indication of "limited regional distribution" or "local farmers' markets." Icons across the top of each entry identify the types of milk used (cow, sheep, goat and water buffalo) as well as whether raw milk is used, if the milk is organic, and if the milk used in cheesemaking comes exclusively from the farmstead where the cheese is produced. These indicators can be helpful if you're seeking a goat cheese made in Maryland, like the ones from Firefly Farms, for example. As the entries are arranged alphabetically by state within seven regions, searching for a specific dairy (or a list of the cheesemakers from a given state) is exceptionally easy. Less easy, unfortunately, is determining exactly where in the state each cheesemaker is located. Nowhere in the book does Roberts provide the sort of detailed state maps that could be useful to a cheese-lover planning a road trip or hoping to visit farmsteads in his or her nearby area. On the whole, however, Roberts, has provided those of us who are eager to know more about the artisanal cheesemakers both near and far with an accessible and informative resource. I have definitely benefitted from having it as I've acquainted myself with the various artisanal producers who sell their cheeses at the farmers' markets in and around Washington. Alice Waters' "The Art of Simple Food"
Mesclun and other mixed-greens salads. Goat cheese. Name-dropping on restaurant menus. All of these now-commonplace foodie conventions (and an impressive list of others) can be attributed, either directly or indirectly, to the influence of Alice Waters and Chez Panisse, her world-famous restaurant in Berkeley, CA. So profound is Waters' impact and that of the "California Cuisine" that she helped to popularize that David Kamp devotes an entire chapter to Waters, Chez Panisse and their culinary contributions in "The United States of Arugula," his brilliant foodie history. 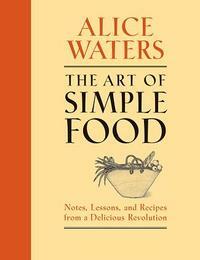 Now, more than thirty-five years after Chez Panisse opened its doors, Alice Waters has released a cookbook to share the secrets of her "Delicious Revolution," as it was dubbed in a 2003 American Masters episode on PBS. She distills her experiences into nine basic rules that should govern anyone who wants to cook (and eat) well. "This book is for everyone who wants to learn to cook, or to become a better cook," says Waters in the introduction to the text. And on that front, she delivers. The book begins with nineteen "lessons" that cover the basics of shopping, preparation and cooking. Some of these lessons cover specific courses like soups, pastas, desserts and, of course, salads. Others deal with cooking techniques like grilling, simmering, slow-cooking, and frying. Each "lesson" chapter begins with a brief paragraph introducing the concept that will be addressed before jumping right into the topic at hand. Rather than discussing bread making in an academic context, for example, Waters takes only a few paragraphs to talk about factors that impact the taste and quality of breads before walking the reader through a recipe for "Herb Bread or Pizza Dough." Lessons that deal with techniques are approached in a similar fashion, with an emphasis on learning through doing in the form of recipes. The second section of the book is a compendium of additional recipes entitled "At the Table." 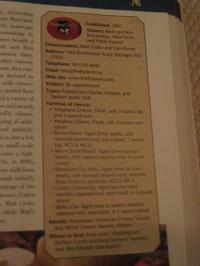 These recipes are separated into broad categories (sauces, meats, eggs and cheese, etc.) and then presented in straightforward fashion. Not surprisingly, the single largest category is the one for vegetables - Waters provides seventy-two different recipes for everything from fennel and chard to potatoes and tomatoes. olive oil to coat the pan"
The offset, bold-faced ingredients are still easily noticed, and the as-you-go instructions help to reduce the risk of omitting a key item or skipping a step. Most recipes are followed by a set of bulleted recommendations on ways to vary the end result without significantly changing the basic technique. To put the book to the test, I attempted to follow Waters' recipes for Grilled Lamb Loin Chops and Lentil Salad. The first recipe was quintessentially Waters - it called for nothing more than salt, pepper and oil to season the meat and a total cooking time of 10 minutes - and it allowed the full, rich flavor of the lamb to shine through. The Lentil Salad was simply dressed with red-wine vinegar, extra virgin olive oil, salt and pepper, and the lentils were combined with shallots and parsley for added taste and texture. I opted to include two of the recommended variations - chopped cucumber and sweet red pepper - to give the dish some more crunch. The final product was flavorful, but unlikely to become a staple in our household. 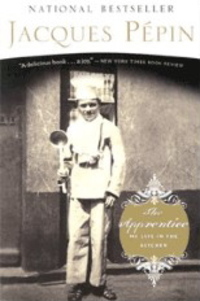 A word of warning: anyone who reads the title and subtitle ("Notes, Lessons and Recipes from a Delicious Revolution") and expects a memoir or even a few anecdotes is in for a disappointment. This is a simple cookbook extolling the virtues of simple food, though it is accessible, clearly written and a pleasure to work with in the kitchen. That should come as no surprise to those who see Alice Waters as one of the people who helped awaken the American palate to the joys of "fresh, local, seasonal ingredients" in the '70s and as a tireless advocate for sustainable agriculture and "edible education" today.